If you follow my blog you will know that Stéphanie has a great talent for styling her photo shoots. Running through the shoots is a natural theme that I love and that I hope my style of photography captures really well. Her maternity shoot was in the wonderful Aubonne arboretum and combined a dream-like fairy feel with the excitement and expectation of the last few months of pregnancy. Henry’s newborn baby photo shoot was simple in whites and blues, with just a delicate nod to an era of rocking horses and wooden toys. For his six month shoot we went all Beatrix Potter with a picnic in the garden. And for that special first birthday, Stéphanie pulled out all the stops with a woodland animal theme. The party table was covered with moss, from a florist friend (please don’t take moss from nature!) and in among the pine cones and leaves were a collection of woodland animals: deer, moose, squirrels and birds. 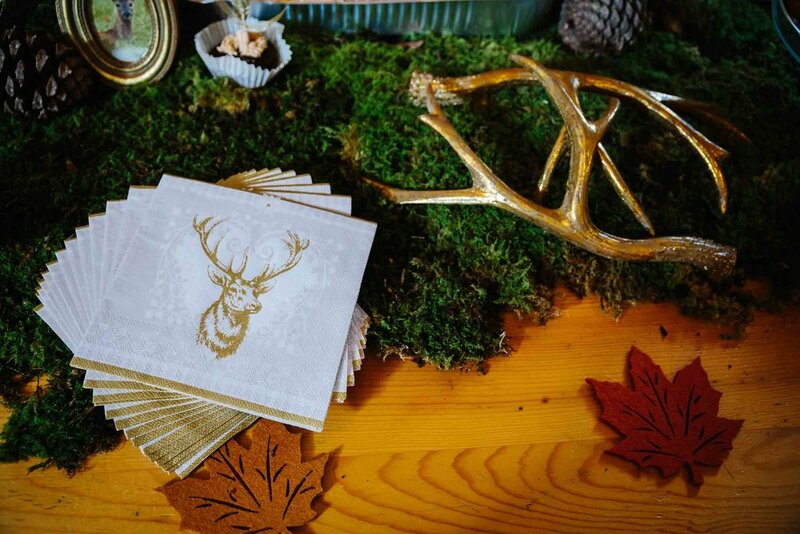 The delicious treats were identified with handmade labels and vintage frames pictured elements from the forest. Even the cookies were themed, with special cut out animal cutters, all baked by mum. 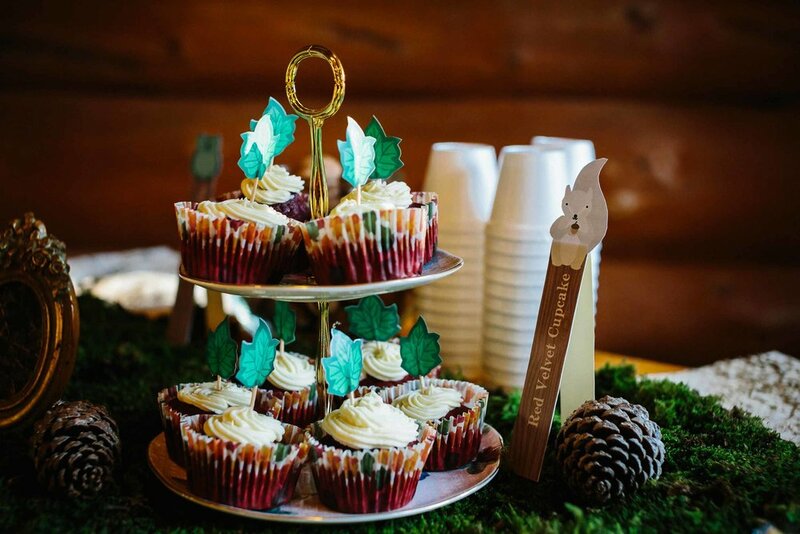 Scrumptious red velvet cupcakes were topped with maple leaves and there was even a bubbling cauldron of spiced apple. For the kids, Stéphanie had made a series of animal masks and had woodland themed colouring pages for the younger ones. 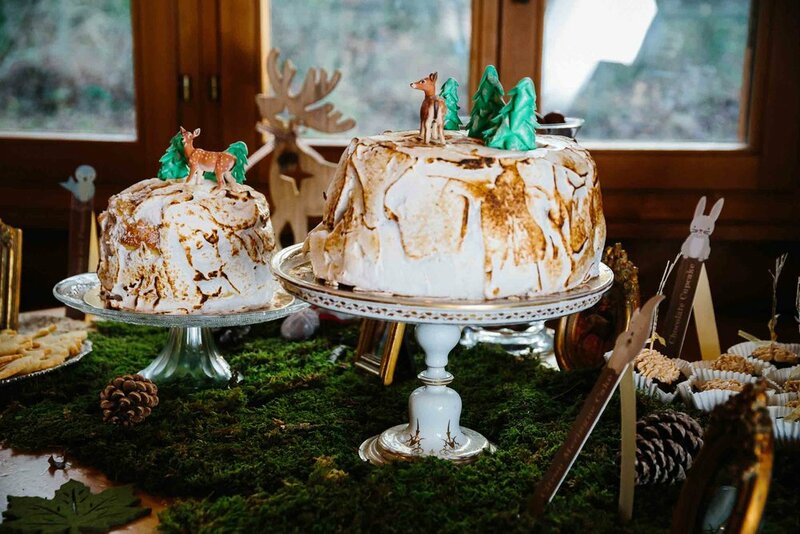 The pièce de résistance was the double meringue topped cake, a snowy paradise complete with deer and fir trees. Little Henry was presented with this marvellous cake as we sang him ‘Happy Birthday’. The first taste of birthday cake is always a challenge, as quite often parents avoid giving their children sugar in the first year. But Henry seemed most impressed with the effort put in by mum! For more information on planning your child’s birthday party photo shoot, please get in touch.